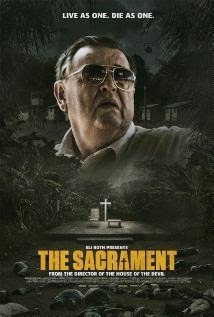 Ti West’s new cult thriller The Sacrament borrows very heavily from (POSSIBLE SPOILER: The Jonestown incident back in 1978) and if you are familiar with this story then the film isn’t going to give you any real surprises, however The Sacrament is extremely watchable and to its credit creates a surprising amount of tension, for a story that has been played out before. The story begins with journalist Sam (AJ Bowen) hearing about a staff member Patrick’s (Kentucker Audley) sister involved in a clean living commune outside of the US. Patrick is concerned about his sister Caroline (Amy Siemietz) being in a foreign country, so they decide to do a story on it too. Taking cameraman Jake (Joe Swanberg) along with them, they end up travelling to ‘Eden Parish’ the community in which Patrick’s sister lives and along with a heap of other people all under the guidance of a man they call Father (Gene Jones). After some early suspicions, the journalists are quite ok with what is happening at ‘Eden Parish’ but slowly they uncover some very unnerving things about the community. Presenting the film as a journalist’s log or documentary presents a few issues for The Sacrament. The camera doesn’t always pick up what is going on and it also it has (unfortunately and unavoidably) my most hated trope at the moment – running with a camera. Having said that the film isn’t a shaky cam fest or anything like that and when the camera is still or peering from a distance it works well in the context of the story. The film builds up from the beginning, taking its time to establish its footing but it is all meticulously planned to maximise the effect when the 3rd act comes around. For this slow build to work, West needed his actors to really sell this and sell it they do. Bowen, Audley and Swanberg are all great in their roles with each of them producing a noteworthy performance, Amy Seimetz does well also coming into her own in the second half of the film when her role becomes more central. However Gene Jones as Father absolutely steals the show, with a creepy, charismatic amazing performance. Father is threatening and dangerous at all times even when he is sprouting his pseudo religious rhetoric in such a laid back Southern drawl, everything he does and says drips with menace and evil. A lot hinged on Father being a figure that the audience could believe people would follow and Gene Jones succeeded on every level. The writing is simple, a little bit blunt but functional however the interview between Sam and Father is sensational, well written and well performed with Father having the audience eating out of his hand whilst Sam the seasoned journo is even taken in by his presence. Whilst the story offered no surprises in the way it was told or panned out, it still manages to shock when the audience is thrown in at the deep end in the 3rd act and it has some deeply unsettling images and combined with the tension that has built up, gives you a knot in your stomach. The realism (as opposed to sensationalism) of the film certainly adds a layer and despite any tendencies to really up the ante and go over the top, West stays within the confines of the atmosphere he has created and it pays off. A bleak story that you may or may not know the source of, The Sacrament is a very well put together film with fine acting, writing and deliberate pacing. It is certainly worth a look. Images from IMDb and badassdigest.